Tanner Norman and Tyler Matzke negotiate the never-ending gauntlet of spectators at the UNM Lobo. Photo by Alan Versaw. La Cueva's Natasha Bernal powers away from the field for a dominating victory at the UNM Lobo Invitational. Photo courtesay of Alan Versaw. 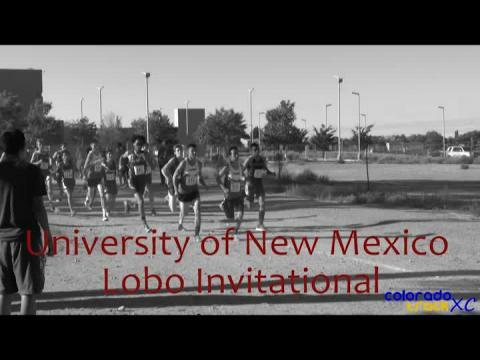 Most of New Mexico's top teams saw their first action at this weekend's UNM Lobo Inviational. Photo by Alan Versaw. A St. Vrain start is always a marvelous thing to behold. You get that opportunity come Saturday. Colorado Track XC file photo by Alan Versaw. Allie Chipman uses a downhill stretch to build a little momentum and take over second place with a little over half mile to go in the race. Photo by Alan Versaw. Looping through the starting line, Miyamura's Nile Thomas and Albuquerque Academy's Jordan Lesansee lead the Varsity Boys Race early during the UNM Lobo Invitational. Photo courtesay of Alan Versaw. One of the showdowns to look forward to on Saturday is a first match-up between an even-more-loaded-than-last-year Rio Rancho team and the defending state champions from La Cueva who return with most of last year's roster intact. Photo by Alan Versaw. Last year on this weekend, Paxton Smith was a contributing member of the Mountain Vista varsity at the St. Vrain Invitational. This year, he's one of Vista Nation's go-to guys in Albuquerque. Photo by Alan Versaw. Emerald Goranson was Socorro's top finisher at state last year as a freshman. On Friday, she gets to help set the tone for a new season at Socorro's own home meet. Photo by Alan Versaw.